To DYE For: How to go from blonde to brunette. | Nicki Kinickie Nicki Kinickie: To DYE For: How to go from blonde to brunette. To DYE For: How to go from blonde to brunette. On Saturday my close friend Michelle, her other half and their gorgeous baby daughter came over for a much needed catch up over some lunch. 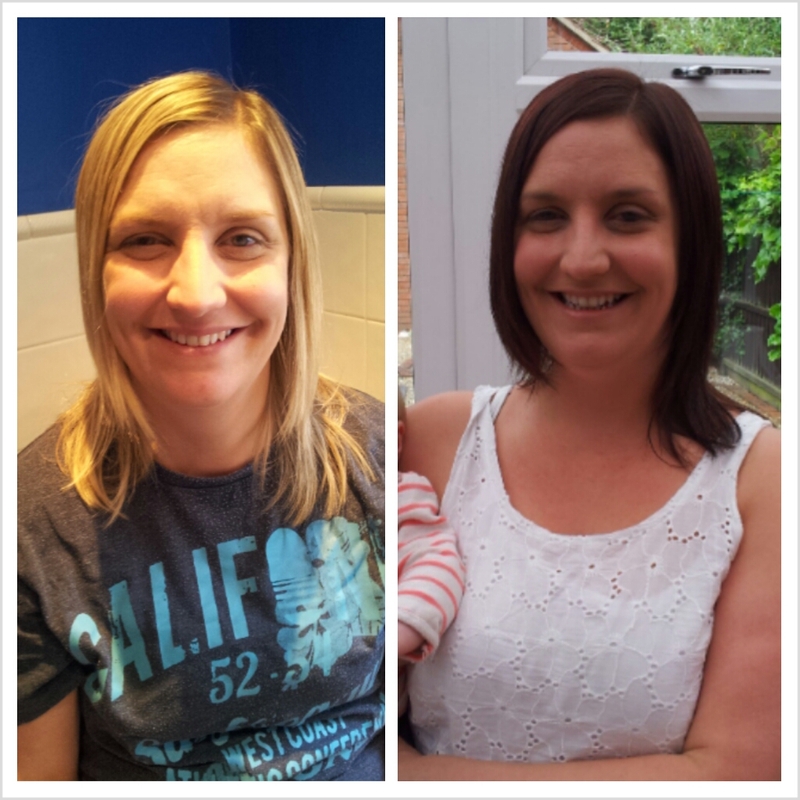 In the week we had been texting about her dying her hair from blonde to dark as unfortunately having a young baby means she either doesn't have the time or the money to keep on top of going to the salon every month to have her roots topped up. Fed up with this fact and the dark roots Michelle had started to think about going brunette, she had had a slightly darker blonde during pregnancy and didn't like it so thought if she wasn't going to keep the highlights up, she wanted a drastic change. After seeing her cousin who - just like her - had blonde hair, blue eyes and has also recently gone dark for exactly the same reason, she was convinced. Because she has only ever been blonde and has only ever gone to the salon she texted me for advice about what to buy, how to do it etc. I said I was happy to do it for her as they were already due to come over Saturday and advised her what to buy etc. I have heard that if you are going from blonde to brunette you need to put red on it first to stop the risk of the brown looking green / grey after you are finished. Bleach strips the hair of any of it's natural components and colours so that's why the brown wouldn't go on well - the red puts a nice base colour on top of the bleach to work from. I had the same done when I went from blonde to brunette. I watched a few YouTube vids to get an idea of what colour red people recommended and whether red dye was OK or it had to be toner (most people just used dye) and then I was ready to go! The red was VERY red (it was a lovely shade though) and made a fabulous base for the brunette we put on top. I told her to buy a couple of shades lighter than the colour she wanted as that was what was recommended and it was good she did as it went much darker! The red shone through slightly too giving it a lovely warmth. I left the brown hair dye on ten minutes longer than the 20 recommended just to give it a chance to cover the red more which was a good idea, I think it would have been too red had it been washed out after that time. We used L'Oreal Excellence Creme which was a nice dye; it smelt yummy and wasn't messy. My only criticism would be there isn't much of it. As you can see my friend has short, fine hair and the dye mixture just about covered it all. There is no way it would have covered my hair, I don't even know if two bottles would have been enough for me! I told her to buy two packs when she decides she wants to top it up again. *TIP* - I got some dye on my bathroom cupboard door which I couldn't get off then remembered I had read that hairspray was great for getting marks off of furniture so tried it and it only worked. I was amazed! So much so I had to share it! 1) Make sure you hair has been washed in shampoo only (no conditioner) and is free from product. 2) Choose a medium to dark red, nothing too bright or unnatural but nothing too dark. 3) Separate the hair with a hair clip so it is done in two sections to ensure every hair strand is covered. Because Michelle had roots I didn't apply much red to them because they didn't have bleach on. 4) Leave for the recommended time. 5) Wash out but DON'T put on the conditioner that comes with it, blow dry. 7) Leave for slightly longer than recommended - I left it ten minutes more and could see it now looked dark more than red so it would be OK to wash off - if you don't want a red tint to the brown maybe leave it a little longer but it could end up going black. 8) Wash out, use both conditioning treatments on to nourish the hair. 9) Add heat protection spray and blow dry. *Add a small amount of Vaseline around the hairline if you are worried about getting dye on your head. Most dyes do wash off of the skin easily though . BEFORE AND AFTER: My friend Michelle. Wow, she looks great! The brunette really suits her and the colour looks lovely. Looks really good. I've always been blonde and would love to try being a brunette one day! You look lovely blonde but I know that if you ever decided to change it, it would look lovely!